I though I'd post a couple of pics of Charlie. 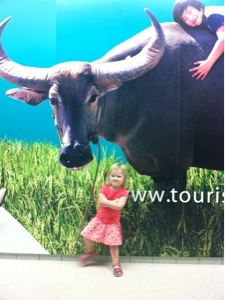 She insisted on having her photo taken in front of this buffalo at the airport. 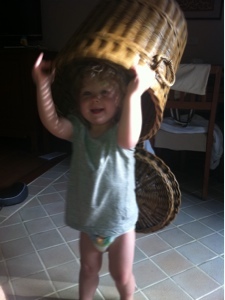 The other is from when she presented my with the laundry basket and said 'Happy Birthday' and then took it and put it on her head. Hey there- if you come across a thai fruit salad dressing I'd be keen to know! Wish we were swimming in a beach at phuket too!